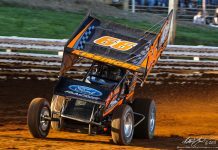 SELINSGROVE, PA – Jason Shultz of Carlisle powered to his third win of the season in Saturday night’s 25-lap 360 sprint car main event at Selinsgrove Speedway on Foss Jewelers Championship Night. 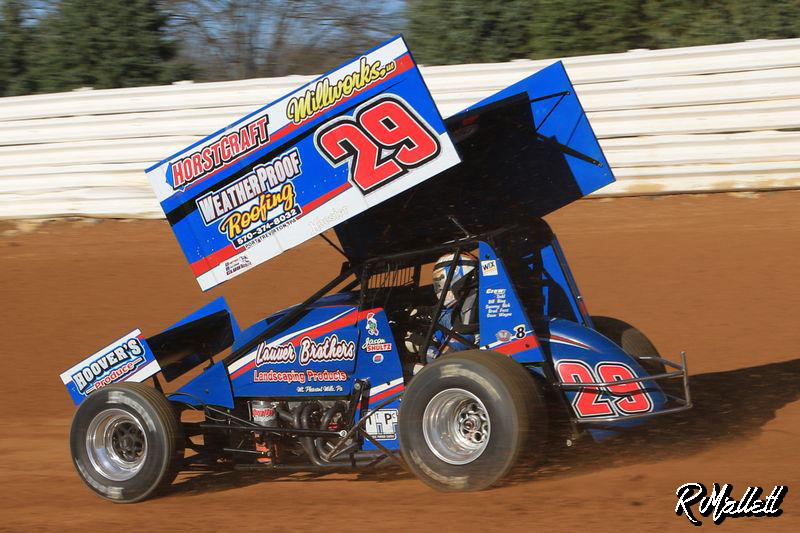 The $2,000 victory was Shultz’s 18th career at Selinsgrove in 358-360 sprint car competition at the wheel of the Horstcraft Millworks No. 29. Davie Franek of Wantage, N.J., clinched his second straight Mach 1 Chassis 360 sprint car track championship. In the super late model 25-lap feature, Andy Haus of Hamburg stormed to his first career win worth $2,200 at the Snyder County oval and in doing so also won the Moon Shine Camo Route 35 Super Late Model Challenge Series by just four points. Bryan Bernheisel of Lebanon wrapped up his first career super late model track championship. Brandon Moser of Middleburg drove to his second win of the year in the 15-lap pro stock feature, while Kyle Bachman of Selinsgrove won his second career pro stock track title. In the roadrunner 12-lap race, Ryan Zook of Mifflintown collected $650 for his fifth win of the year. Keith Bissinger of Orangeville recorded his sixth track championship in the division. 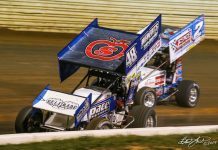 Selinsgrove Speedway is back in action with a big holiday weekend racing program at 7 p.m. SUNDAY, Sept. 2, with the Jeff’s Auto Body & Recycling Center Summer Spectacular featuring twin 30-lap features for 360 sprints, sanctioned by the Patriot Sprint Tour, and super late models paying $3,000 to win and $300 to start. The pro stocks and roadrunners will also be on the racing card. Pit gates will open at 4 p.m. with grandstand gates at 5 p.m. There will be no racing Saturday night. Polesitter Colby Womer powered into the lead at the start of the 360 sprint car feature with third-place starter Adam Carberry getting by second-place starter Mallie Shuster for the runner up position. A hard crash by Jim Shuster in turn three on lap four brought out the red flag. J. Shuster was not injured. When the race resumed, Womer continued to lead the way. At the completion of lap five, Womer was setting a torrid pace in front of Carberry, fourth-place starter Ryan Taylor, eighth-place starter Chad Layton, and seventh-place starter Jason Shultz. On the eighth lap, however, Layton’s car blew a tire and he was able to rejoin. Shultz passed Taylor for third on the restart and before the lap was completed got by Carberry for second. Shultz reeled in Womer in a wheel to wheel race for the lead with Shultz making the winning pass using the inside lane in turns one and two. On the 18th circuit, ninth-place starter Mark Smith passed Womer for the runner up spot. Smith attempted to catch Shultz for the lead and win to no avail. Shultz was victorious by 3.5 seconds over Smith, Taylor, Womer, and Carberry. Front row starters Bryan Bernheisel and Andy Haus dueled for the early lead in the super late model race. Haus came away with the lead as fourth-place starter Jeff Rine quickly advanced to second. An early race caution on lap three for Rance Garlock’s disabled race car in turn four regrouped the field. Haus continued to set the pace when the green flag waved again. At the halfway point, Haus navigated his way through slower traffic with Rine, Bernheisel, fifth-place starter Randy Christine, and 10th-place starter Jim Bernheisel in tow. On lap 19, Rine’s car dropped off the pace entering turn three and was struck by Coleby Frye’s car. Rine was able to rejoin the race with the Moon Shine Camo series title in jeopardy now. The restart saw several cars get involved in a tangle in turn four. In the final laps, Haus held the field at bay and posted a 4.2 second margin of victory over Christine, B. Bernheisel, J. Bernheisel, and 14th-place starter Dylan Yoder. Second-place starter AJ Hoffman pulled into the lead at the start of the pro stock feature but was passed by fourth-place starter Brandon Moser in turns three and four of the first lap. 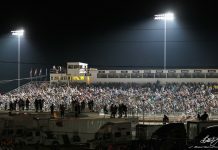 While Moser set the pace at the front of the pack, Hoffman held down second and multi-car race for third took place between polesitter Cory Long, fifth-place starter Shaun Lawton, and sixth-place starter Kyle Bachman. By lap five, Bachman secured the third spot and closed in on Hoffman for second. On lap nine restart, Bachman slipped by Hoffman for the second position and chased Moser to the checkered flag. Moser was victorious by just .90 of a second over Bachman, Hoffman, Lawton, and AJ Stroup. Fourth-place starter Will Brunson led the first lap of the roadrunner race with a lot close competition behind him. For the first couple of laps, Brunson held off sixth-place starter Bob Bussey for the lead. On lap four, Bussey took the lead while Brunson held on to second and eighth-place starter Ryan Zook raced third. Zook took over the runner up position on lap nine and quickly closed in on Bussey. The final two laps were the most suspenseful of the night as Zook raced in Bussey’s shadow. Racing off turn four for the checkered flag, Zook won the race by a half car-length over Bussey. Brunson, Jake Jones, and Smith Cope rounded out the top five.